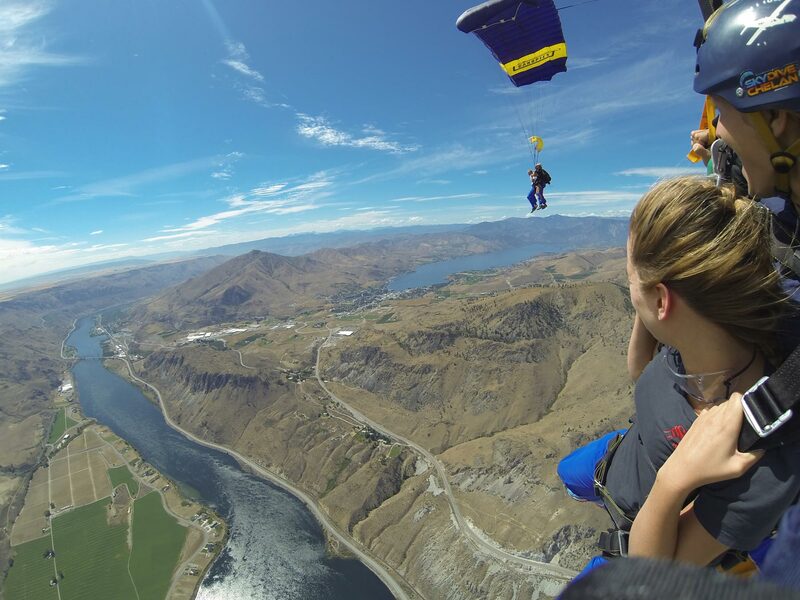 Consumer alert: Skydive Chelan is not affiliated with any other booking company. Only purchase from our website www.skydivechelan.com or over the phone with us at 509-881-0687. Give them a gift they will always remember! Gift Certificates are available year round for any occasion! There is a $50 non-refundable deposit per person to hold your spot. NOTE: This amount is temporarily held from Gift Certificate when booking is made. Any changes made within 48 hours your scheduled jump will result in the forfeit of the non-refundable deposit(s). You must provide a doctor’s note stating you are in good physical health to skydive if you are over the age of 65. You must weigh less than 220 lbs. Please call if over 220 lbs, we may be able to make special arrangements & there is an additional charge of $20. You must provide a government issued photo identification in order to participate in Parachuting activities. You must read, agree, and sign our standard assumption of risk agreement and contract waiver. Please call us at 509-881-0687 the day of your jump to confirm weather conditions with our office staff. If we determine your class time is not able to jump your non-refundable deposit will remain on your account so that you may reschedule at a later date. A redemption code will be issued with the purchase of a Gift Card. The amount selected for the Gift Card funds are applied automatically to eligible orders during the checkout process. All Gift Card transactions are final. If you want to increase the Gift Card value at a later date, then a new transaction will be required. Gift Cards may be used only for the purchase of eligible goods on our website and at Skydive Chelan for skydiving or items sold there. Gift Cards expire one year from purchase date. We are not responsible if a Gift Card is lost, stolen, destroyed or used without permission. Note: GIFT CERTIFICATES ARE ALSO AVAILABLE FOR LICENSED JUMPERS OR CONTINUING STUDENTS in any denomination. For pricing on licensed jumps click on the “Skydiving” and “Licensed Jumpers” tab at the top of the page. Licensed Jumpers or Continuing Students please bring in your Gift Card for redemption. Please call us at 509-881-0687 with any questions. This is the price per person for a Tandem Skydive. Video and/or Photos are available at time of check-in. Add a video to your skydive! Order on the day of your jump when you check-in. Add still photos to your skydive! Order on the day of your jump when you check-in. Add a Video & Photos Package to your skydive! Order on the day of your jump when you check-in. *please note additional charges of $20 apply for customers over 220 pounds. NOTE: Video and/or Pictures are available for every customer. The camera(s) located on your instructors wrist. Videos are approximately 8 minutes, edited with music. Still pictures are taken at the highest resolution, receive approximately 300 photos.